A large new housing development of around 5,000 new homes — known as Kingsfleet or the Sustainable Urban Expansion (SUE) — has been granted planning permission on the northern edge of Thetford. Phase 1, comprising around 1050 new homes, is due to be developed between 2018 and 2024, on the land inside the A11, between the A1075 Norwich Road and the railway line. Above: The area covered by Phase 1 of the Kingsfleet development, with the locations of key features marked. Sub-Phase 1a comprises the first 343 houses (33% of phase 1) and a local centre, and is being built by Hopkins Homes at the end of the site nearest Joe Blunt's Lane. Access to the estate will be via a new traffic-light-controlled junction on London Road. Construction work on the site started in September 2018. Work on the new junction and associated road widening will start in February 2019, and is expected to take around 6 months to complete. During the work, the A1075 Norwich Road be closed to outbound traffic between Kilverstone Road (by Tesco) and the A11. Inbound traffic will still be allowed through, but will be subject to a 20mph speed limit. Phase 1a Site Plan, highlighting main roads and cycleways (source). The Phase 1a Affordable Housing Locations Plan shows 51 affordable homes out of the total of 343 (14.8%). Three hectares of land allocated for this is shown on the Phase 1a Plan 1005, as being to the west of the railway, immediately north of Joe Blunt's Lane. The remaining hectare is to be located within the main development. Norfolk Constabulary have since changed their priorities, so this may not actually be required now. The proposed site of the school is show on the Phase 1a Plan 1005, as being in the middle of the Phase 1 area, immediately to the north of the Phase 1a development. The above policy does not appear to have been enforced by Breckland Council during the planning process. Instead the only requirements are Outline Planning Conditions 29 and 30, which require a plan for routes for bus services, and that these routes are available by 80% occupancy of the phase. 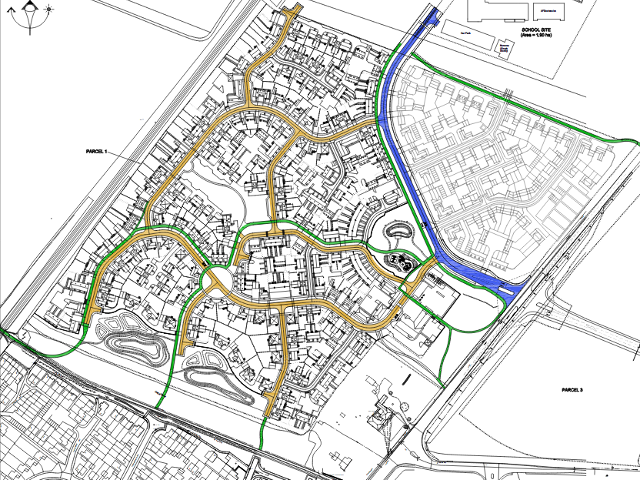 The Phase 1a plans include a good walking network, but the cycling network is less good, with key routes missing. Also, the networks do not currently integrate well with the rest of Thetford. In particular, there are no good links with the existing Tesco superstore and Green Lane. This may well be addressed in later phases of the development. Despite being raised in comments to the planning application, Breckland Council has failed to enforce this policy. In later phases of the development there is provision for further schools, two community centres, more open space, and healthcare and library financial contributions. Full details can be found in the Section 106 Agreement. Hopkins Homes to deliver first phase of Thetford scheme, Crown Estate press release, August 2017. OneThetford is run as a source of public information, and is independent of any councils or other organisations. More about this site. Page last updated 22-Mar-2019.